Located in guard gated community just south of the strip, this one bedroom one bathroom condo is in a perfect location. It was fully renovated with all new furniture and appliances to cater to guests as the ideal vacation condo. The community has 3 pools, spas, tennis court (racquets & balls available upon request), gym and an outdoor grill available to use anytime located behind the tennis courts. This 2nd floor condo has a queen size bed, 2 flat screen TV's, high speed internet, WiFi and cable all included. There is a full size washer and dryer inside, an outside balcony and a covered assigned parking space (a car is a must and Fox Car Rental is right across the street). NOTE: If you do not see availability on the calendar for the dates you require please call or email us for options on other similar units with king size beds. This unit is ozone sanitized. **Returning Guests: Get Discounted Rates. ** Longer stays get additional discounts. I reside in Las Vegas and have a ranch in Montana. I decided when I retired to create the ideal upmarket condo to cater to Las Vegas visitors looking for a different experience from strip hotels. This condo is in a more relaxing environment yet close enough to all the strip amenities with fun and action minutes away. I loved that this community is guard gated and so close to everything Las Vegas has to offer yet quiet and peaceful. The grounds are exceptional with large mature trees and plenty of guest parking. Telephone Provided. Long distance calls incur extra charges. Gym is equipped with all machines and weights. Cox Cable is in the unit. Movies On-Demand are available for Cox Cable prices and deducted from your security deposit. Lake Mead is about an hour from the condo where boat rentals are available. Mt. Charleston is about 45 minutes away. Tennis racquets available upon request. 3 pools are in the community. 1 large on in the center and 2 smaller ones on either side. The main pool is open all year and is not heated. Each pool has a hot tub. Great home away from home. This wonderful condo is my home away from home. Everything is there. 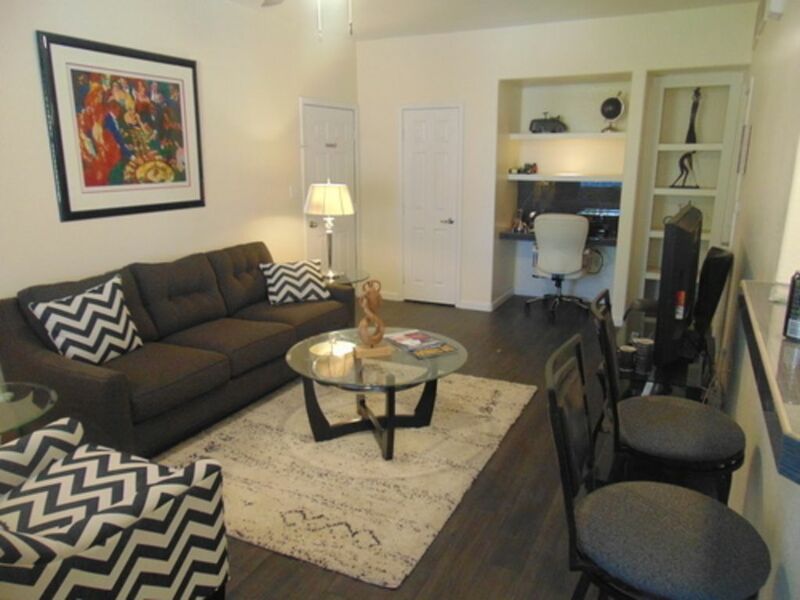 Excellent condo, clean, perfect in every way, good communication, looking forward to another visit here! Great stay and convenient location to Luxor. Condo exactly as it appears in photos. Very clean, quiet and Ken had all check in papers very orderly. Will definitely stay again. The property is very nice and comfortable but could have used a king size bed rather than a queen. the kitchen was very well equipped and the selection of TV channels was adequate. Parking was close by and the security was good. Ken upgraded us to stay in his two bedroom condo. It was a really beautiful home away from home. Again my wife and I absolutely enjoyed our stay. Weather was great for the two weeks , 10 grounds of golf in 14 days. Enjoyed our stay here - everything is supplied - towels, dishes, coffee makers, etc. Very clean and well kept - nice area away from the main strip - Quiet !! Looking forward to our next stay. We are located on Las Vegas Blvd., just 4 miles south from the famous Las Vegas Strip. The condo is 1 mile from the South Point Casino, 2 miles from Outlet Shopping, 3 miles from the TAYLORMADE GOLF EXPERIENCE and Town Square. A vehicle is a must and Fox Rent A Car is right across the street. - Tax is Included - Cleaning Fee: $100 - Refundable Security Deposit: $250 (It can be increased for the length of stay and number of guests.) - Discounts: Apply for a stay of 7 days and 30 days or more. - Returning Guests: Receive a 10% discount and reduced Security Deposit. - Credit Card used must match the name of the Guest on the rental agreement or added to the rental agreement. - If you are booking far enough in advance, we can schedule you to pay in 2 or 3 payments. - VRBO/Homeaway Service Fee: This fee is not collected by the owner of the property and no services are provided by the owner of the property for this fee. Any refund of this fee due the guest is payable by HomeAway/VRBO. The Owner does not control the amount of the fee, any questions about this fee should be directed to HomeAway/VRBO.